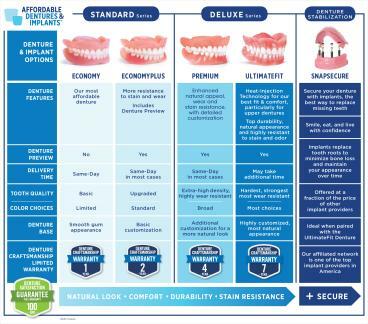 Affordable Dentures - Toledo, Ruby E. Fifer, DDS, Inc.
Sylvania-Toledo, Ohio Affordable Dentures & Implants offers several styles of full dentures, each with special features and advantages. It’s part of our mission to put transformation within reach. See below for more details, or call us at 419-580-1101 if you have a question about a particular style. If you're considering your options for dentures and implants in Sylvania, OH, look no further than the services offered by Affordable Dentures & Implants®. We treat our patients with dignity and respect, and we want to give them good reasons to smile. Our practice proudly provides a wide range of options to our patients, and we'll take the time to thoroughly discuss all of your treatment choices. We improve smiles as well as lives. At our location, we take pride in our continued innovation in affordability, speed, accessibility, and patient satisfaction. Our goal is to create a smile for everyone in a hassle-free manner. We offer same-day services, and each one of our patients is treated with a high level of compassion. It can be difficult dealing with dental issues, so we'll provide you with the caring service you need and deserve. For some of our patients, implants may be the life-changing solution they’ve waited for. Implants can help your jaw maintain its bone structure, leading to a more youthful look. We'll take the time to examine your teeth and jaw to determine if you’re a good candidate for implants and answer any questions you have about your options. Give us a call today if you live in Sylvania, Toledo, or a surrounding area to find out more about our work with dentures and implants. Our practice owner Ruby E. Fifer, DDS, FICOI, FAAIP has a Doctor of Dental Surgery degree from The Ohio State University College of Dentistry. With many years of experience treating different types of patients, we can help with any situation. We employ a team of highly skilled lab technicians who have created dentures for thousands of patients. Our office is equipped with an in-house lab so that we can keep our fees affordable and offer same-day dentures as well as implant solutions. 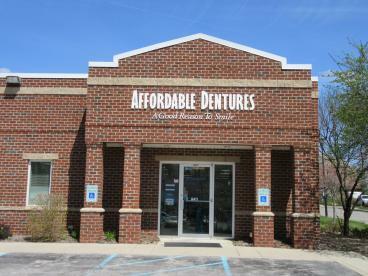 Affordable Dentures of Toledo is located in Sylvania, OH and opened in 1999. Each year, we treat more than 2,000 denture patients who travel from Sylvania, Toledo and many other communities in the surrounding area. Please fill out the form below to request an appointment. For immediate assistance, please call us at 419-580-1101.